With the release of the Brazilian Bulldog, we want to hear your stories to share with us and the rest of the community! To get us started, here are some of my Battles. I don't normally play light tanks because I'm quite bad at them but the Bulldog is just soo easy to play! I'm really liking this tank and I've already earned my Ace Mastery Badge! Wooohoo! Can you guys do better? We didn't have to win right? Just knock Max's crown off. Because I did only manage to win 1 of 4 games played in the tank thus far. Nothing like having a friendly IS-3 try to troll you, only to find out that while the tank has a shoddy engine, it's not hard to outmanhoover an IS-3. Edited by Corporal Derpy, 08 October 2015 - 09:56 PM. Edited by Quazakaharet, 08 October 2015 - 10:17 PM. Well that would require me to play a game, and I ain't doing such a thing at this time o' night. As I see it, you wont really be making much bonus XP, VIII Premiums ain't about that, and it may also not be making incredible amounts of Silver either due to the fact you may have to load up the Grenn Frey song at some point, and that Cola is quite worth using on it. But in the Defeat, I fired a good amount of HEAT into the turret side of an AFK T30, and in the other game I fired only one shot into the side of a Tortoise's upper casement. Think it's around 300 a piece for the HEP/HE, and 4,000 for the HEAT. "Quick, make a thread so we can make the M41b Bulldog look good!" It's not that bad of a tank, although it's still not the best either. But if you want a quite poor tank to play that doesn't really have much going for it, wait for the T95E2 to reappear. If a Bulldoge can flank, it can hurt, hell I penned a T-54 in his side, and likely would have got a good deal of damage with his engine on fire had the game not almost immediately ended by cap. 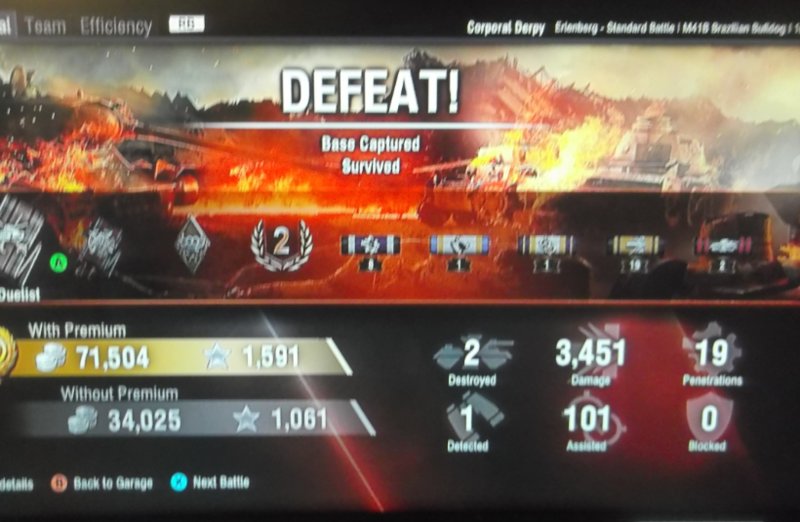 Although I have been lucky thus far to only get Tier IX games, and thus yet to face Tier X's, if you can play it sorta like a flanker who takes opportunistic darts at occupied enemies, you can hurt them quite well, and there's something fun about being able to drift at the side of an Awful Panther, end him and instantly set a 13 90 on fire for trying to rush at you, because Lights have yet to fire out that it fires HE and that they have no armour to block that. I never said it was bad, the thread looks really staged though. I'd pick one up if I had the maaahnies. Nah man, Max is just trying to look good, and the Bulldoge is the only tank he can do that in. .... ive been on the fence so long on this tank im going to have to hire a crew to reinforce the darn thing. guess its back to try it again in test mode. Especially because the reload is like, 6.19 or something, whereas mine is at 4.98, relatively quick reload which leads me to believe that the crew is like 50 or 75% in the target practice mode. Frankly I just have a single Yank crew who goes in any Yank tank I get. Well.....if we're bragging....can't help thinking I might have done a little better if I had had some support. Still, not bad for a defeat. Battle #6. Got my Ace last night. Edited by CuttinEJ, 08 October 2015 - 11:42 PM. Two wrongs don't make a right. But three lefts do!!! Ive killed 5 of them. My best game out of my first 20 is attached below. It's nothing great, but it was an Ace badge. Looking at all the pictures I can quickly calculate an average of 160-170ish damage per penetration. That right there shows the unreliability of the HEP round, and it's actually lower than that because a lot of those penetrations were HEAT. The numbers speak for themselves. Edited by Pontiac Pat, 09 October 2015 - 02:27 AM. "when the truth, finally dawns, it dawns in fire". Too bad Max. I had to kill you on Cliffs in my T71. Still like the AMX 13 90 better though.